Knives Plus STROP BLOCKs are Leather Strops that are hand made and pre-charged with a high quality polishing compound for trouble free operation. 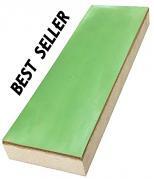 Each strop is stretched on a wood block and tested for proper polishing action. Leather strops are excellent for finishing razor edges on knives or razors. We make'em right here in the Knives Plus shop and test each one to be sure it works right!